In 1856 Richard Hüttig became a joiner in Berlin. He had been apprentice in a joinery for camera cases. He became master of this profession. Later, in the 1860s, he became chief of a big camera factory which moved to Dresden in 1887. 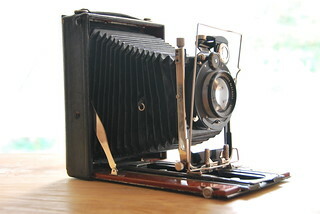 His company, Richard Hüttig & Sohn (later Hüttig AG), had been the biggest European camera maker for a certain period. It was the first company in Dresden that produced a single lens reflex camera, the Zeus-Spiegel-Kamera. In 1904 it offered 90 camera types in 400 variations. After the merger of his company into ICA in 1909 the career of Mr. Hüttig declined. As a poor old man he got a place in a home for the aged from the Council of Dresden. This page was last edited on 23 September 2016, at 10:37.